Discussion in 'Official Information' started by NobleProductions, Dec 6, 2017. Looking to trade in-game items or money in exchange for a package from one of our stores? Then look no further, our IRL Trading system is for you. Before committing to an IRL trade, be aware that once you have both confirmed the trade, you are locked in. If you are purchasing the store package for the other player, you have 6 hours to purchase it. If you do not purchase the package within the allotted time, the transaction will fail, and the items and money will be returned to the other player. If you fail 3 transactions, you will no longer be allowed to use the IRL Trading system. In order to begin a trade, simply do /irltrade <player>. They will have a few seconds to accept the request, otherwise it will time out. If you receive a request, you can either click the message that pops up, or do /irltrade <player>. 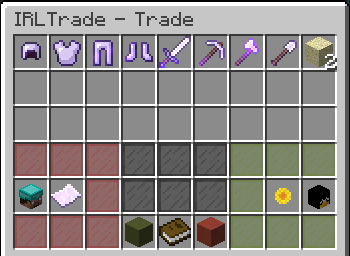 Upon the receiving player accepting the trade, you will be presented with this GUI. 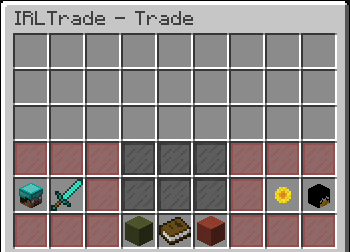 The player requesting the trade will choose a store package that they will purchase, whilst the receiving player will choose how much in-game money and what item(s) to offer in return. Once both players are happy with the offer, you will click 'accept', which will change the stained glass panes green. Once both players accept, the trade will be confirmed, and a URL will be generated for the paying player. Upon confirmation, a URL will be generated for the paying player, and the items and money will be taken from the receiving player until the transaction is either successful or fails. Just like that, you can safely trade in-game items and money for store packages without the need for a middleman! Let us know what you think, and if you have any suggestions for IRL Trading, be sure to make a suggestion thread.